Friday means another blogger sharing their issues! Today is none other than the Ninja Mom herself, Nicole Leigh Shaw. So without further ado, I’m going to let her take over because, well, she’s a ninja. You never mess with a ninja. Blog: Well, that’s a bit tricky. I started blogging, publicly, as NinjaMomBlog.com. I still do. But, I’ve recently launched NicoleLeighShaw.com, because it turns out I’m not only interested in writing about mommy things. Who knew? Why? Because I’m an incurable egotist who likes the metaphoric sound of her own voice. That’s the truth of it. The shine I like to put on it is that I might have things to write about that are interesting to other people. This proves to be true, some of the time. I write essay-style humor and internet-friendly humor and even mime humor. I derive a certain pleasure from making fun of mimes. In fact, the more humor you write, the more you realize there are particular punch lines you can’t let go of. Mimes feature more than they should. Also, dead pet jokes. I write a lot of those. Particularly about the unflushability of certain pets, say, ferrets. You can flush a goldfish, not so a ferret. This amuses me. It’s probably a topic my therapist would like to hear more about, but for now I let it play out in my humor writing. Specifically, I currently write for NickMom.com, WeAreTeachers.com, Moms.FortWayne.com (as well as their print incarnation), Swimmingly.com, Mamalode.com, InThePowderRoom.com, and have written for Fandango’s Family Room and I don’t even know where else but if someone owes me a paycheck, would you kindly pay me? First thing? I’ve never noticed. Gosh, what would be a great answer here? “I think about how I can put out positive energy for the day and end each night as a better person.” The truth is that I probably think about the Keurig. Professionally, I need a benefactor who will provide me a house-cleaning and babysitting stipend while I write. Not available on Craigslist. I’ve looked. NickMom.com, where I can see that all of my writer colleagues have been so very much funnier than I am. I’m not really good at consistency, truth be told. I visit different sites every day. I like Swimmingly.com lately, because the writing is sharp, and no I don’t mean my own writing, but sure, that too. I also like to hit up Medium, which is always loaded with thinky pieces. But, mainly, I use the Internet like a cat uses chopsticks. I can contort my tongue into three little folds. I’m not the only one, but it’s not like there’s a ton of tri-fold tongues running around out there. 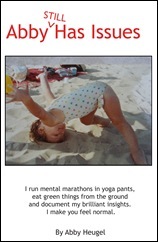 I also have only one-and-a-half toenails, but I hardly call that a talent or an accomplishment. Home, mostly. Unless it’s filthy, which it usually is. So, someone else’s home. Well, there’d be very clear signs indicating that you can make a left turn on red if you’re turning onto a one-way road because that always makes me break out in nervous sweats. Turn, don’t? Wait for green? Why is this so hard? All relative. Am I PMSing? Then the best thing in my fridge is cheese and dips for things, including more cheese. If I’m not PMSing, then it’s the veggies. I have a fair amount of veggies and fruits and also Greek yogurt, because if the current yogurt-marketing machine is to be believed, Greek yogurt cures everything from cancer to plantar warts. P.S. I have some good posts lined up for next week. If you don’t want to miss anything, be sure to subscribe here on the blog and/or follow me on Facebook, Twitter or Pinterest. 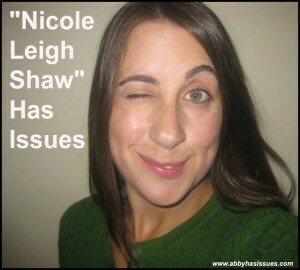 This entry was posted in Uncategorized and tagged blogger issues, blogging, NickMom, nicole leigh shaw, ninja mom. Bookmark the permalink. Thanks for interviewing me! I can honestly say that it was way more fun than a job interview. HAPPY BIRTHDAY, Abby dear. You’re he cat’s meow. Or the cat’s pajamas. Whichever is cooler. Like a cat uses chopsticks? That is one of the most hilarious lines I’ve never heard before! Also, I’m curious about the one-and-a-half toenail thing. Do I really need to know more? No. But I bet it’s a great story! Aw, shucks, thanks! I was trying to think of a good analogy and suddenly cats and chopsticks and the rest is history. I was born without toenails, though I’ve bravely triumphed and grown 1.5 of them. I’m also missing a bunch of toe bones and the ones I do have are pretty much hunchback of Notre Dame material. Reading your “they ate my toenails!” confirmed what a sick woman you are! This is why we love you so. Great interview! Worthless Craigslist. P.S. My first thought tomorrow morning is going to be about proving you wrong RE: the flushability of ferrets. But for today? It’s off to the ferret store! Oh, I bet that store smells GREAT. This is great, I love Nicole and all of the reasons why come out in this interview. Both at the same time. Dammit woman, are you a nurse or aren’t you? I want someone to ask me if they can give me money, too. My favorite place to be is at home, too.. but not my home b/c it’s so small you have to go outside to change your mind. I’d love to hang out with you…maybe we could find someone who will let us borrow their home so we can hang out together. Yeah the first thing I thought of with the “what do you think of when you first wake up” question was coffee.Sometimes I get out of bed even when I’m still sleepy because I’m THAT excited about coffee. She loves to hear herself talk, too. Although, I love to hear her talk as well. Great interview, and hope you had a happy birthday, Abby!